Female athletes wearing headscarves raced Friday against a backdrop of russet-hued mountains, more for the taste of freedom than the feat of winning Bamiyan’s international marathon, Afghanistan’s only mixed-gender sporting event. Braving the autumn chill and defying convention, the 15 women — including six Afghans and an Iranian — rubbed shoulders with male athletes, starting the marathon at the base of cliffs that once sheltered giant Buddha statues, blown up by the Taliban in 2001. They ran in flowing white shirts, but even these felt unusually free: Nilofar, a 21-year-old medical student from Mazar-i-Sharif, said she usually trains in leggings and a dress that goes down past her knees. “Running gives me freedom,” she said. More than 100 runners in total, both Afghan and foreigner, participated in the marathon, a 42-kilometre loop that started and ended at the base of the world famous Buddha caves. The race, organised for the second consecutive year by two Englishmen — James Bingham and James Willcox — does not simply represent a rare sporting success in conflict-torn Afghanistan. It also stands as a metaphor of freedom in a conservative Islamic country where running in public is widely seen as nothing short of a subversive act for women. Bamiyan, perched in Afghanistan’s central highlands, is a rare oasis of tranquility which has largely been spared the wrenching conflict that afflicts the rest of the country. It is a perfect venue where athletes such as Nilofar can run freely. “In Mazar-i-Sharif, I train in parks with permission of the governor who supports us. I cannot run in the streets,” said Nilofar. Other female runners face similar restrictions, such as 18-year-old Samana, who can normally only run in her Kabul neighbourhood before daybreak when the area is secluded. But Nilofar, who participated in a race in Kabul in the summer of 2015, recalls being harassed there. “We were four girls, passers-by kept bothering and harassing us, and cars kept coming in our way. Women who run in public are deemed crazy,” she said. The female athletes faced no harassment in Bamiyan — running freely along a picturesque route as they passed by puzzled but friendly farmers and livestock occasionally blocking the way. “Running is full of risks — sometimes we get beaten up. People are not used to seeing women running, but I have to keep going in order to pave the way for other women,” said Kubra, another young athlete from Kabul. Kubra was encouraged to participate in the marathon by Cornelia Schneider from “Free To Run”, an organisation which helps women and girls in conflict-affected areas. On the marathon trail, Kubra ran alongside Martin Parnell, a Canadian star in his 60s well-known for record-breaking feats including running 250 marathons in one year. 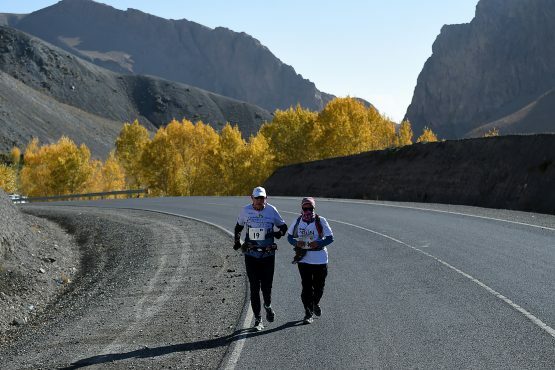 Running in Bamiyan can be daunting: the valley is at an elevation of 2,500 metres (8,200 feet), and the runners climbed until 3,000 metres, even though many of the participants had little time to acclimatise to the altitude. Mahsa Torabi, from neighbouring Iran, was running short of breath. This April, she became the first Iranian woman to complete a marathon in the ancient city of Shiraz since 1979. The 42-year-old now hopes to organise a mixed marathon in Tehran in the spring. “I wanted to test myself and show that Muslim women can also run a marathon,” she said.